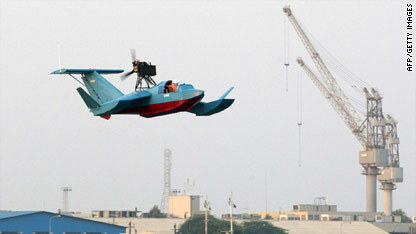 Iran's Defense Ministry released photos of what it says are its new radar-evading flying boats, the Bavar 2. "Islamic Republic of Iran is one of the few countries which managed to design, build and use flying boats in a short time," said Defense Minister Brig. Gen. Ahmad Vahidi, who oversaw the delivering of the aircraft at the Bandar Abbas naval facility on the Persian Gulf near the Strait of Hormuz. The delivery comes as Iran celebrates its Week of Sacred Defense, which commemorates its eight-year-long resistance to the 1980 Iraqi invasion, according to the Fars News Agency. 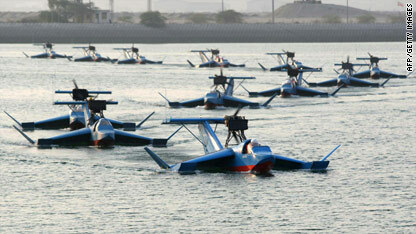 The flying boats look like one Iran used during Persian Gulf war games in April 2006. Media reports from the time include a video of a flying boat taking off. After those 2006 reports, bloggers poked fun at Iran’s so-called stealth technology, saying the flying boat looked like something anyone could buy in kit form from mechanical magazine ads. Iranian "engineers" are still working on perfecting the Hong Kong Phooey Mobile. Reminds me of the fearsome Scud missile from Desert Storm I, pathetic compared to US smart bombs that we could watch on tv as they flew down a chimney. I guess the Scud was kind of like a smart bomb, because you fire it from the trunk of your car then go home and watch CNN to see where it landed. Thanks Sam. Lake Wikkiwokki Amusement Park sells off it's last 1970s era kiddie ride, Iranian military hits the next level. The American Way, baby. Saw this story last year, they do look like fun toys. Sounds like the vehicle would be the worst of both worlds. They copied Air Hogs. Just remember the geography lesson from Flock of Seagulls: "Iran, Iran's so far away...."
What happened to the flying monkeys with eggs? Iranian technology advances another step. Actually they're manual drones – kinda cool unless your the pilot. it's called a sea plane we've had them for years, wow you reinvented the pontoon?? These are small ekranoplans. Wing-in-ground effect, or WIG aircraft, are not new and these in fact seem to be a very old design. How on earth they could be considered stealth aircraft is beyond me. That rotating prop would shine on a doppler radar. Get a funky old design and call it "stealth"? These "Engineers" are the type who put machine guns in a front-prop planes and then discover (the hard way) why others use timing chains for the guns. Ha. It looks like a generic seaplane with a 50 cal. machine gun attached...Oh no! Im so skeeeeerd......Do you know what an A10 Warthog would do to their "flying boats"? Swiss cheese baby.......Lol. The A-10's would not even need to shoot these flying boats down as a simple high speed pass at close range would probably blow these things into pieces. Target practice! This would be fun! A plane with a 50 cal is not going to sink an aircraft carrier. Its not even going to get in range to fire on it. These aircraft carries utilize very accurate and very destructive chain guns. These particular aircraft are no more than target practice. That does not mean Iran does not have the capabilities to sink american ships, but they aren't going to do it with this weapon. Looks like toys made in China!